Radon is a radioactive gas which is colourless, tasteless and odourless. It is impossible to detect Radon without the use of sensitive test equipment. Radon is a naturally occurring gas that is produced by the breakdown of uranium in soil, water and/or rock. If allowed to accumulate at high levels for a long-term, it can be hazardous to health. Radon is the second leading cause of lung cancer while cigarette smoking is the primary cause and leads to more lung cancer deaths. The EPA (Environmental Protection Agency) suggests that corrective action can be taken to reduce the radon levels in your home if it’s measured over the long term at 4pCi/L or greater. You can also visit the EPA website at www.epa.gov/iaq/radon/index.html for more information. The Safety Siren Pro Series3 Radon Detector should be positioned in the lowest living area of your home in a location where it will be kept undisturbed. The audible alarm should be able to be heard from those areas. A second detector can also be placed in a basement room that is rarely used. This is also a good means to determine the levels of radon in your home. No other obstructing objects should be placed within 4 inches of the detector. The Safety Siren Pro Series3 Radon Detector is well designed to plug into a standard 120–volt household outlet using the provided and attached power cord. The detector should be placed face up on a tabletop or any other flat surface where the ventilation slots won’t be blocked. Remember to keep the detector dust free. A proper airflow must be maintained through the detector so as to obtain an air sample representing the local environment. The Safety Siren Pro Series 3 Radon Detector’s display is designed to notify the user about the radon gas levels on either a short–term or long–term basis and is updated every hour if there is a change in the levels. Both long-term and short-term measurements are run simultaneously and can be accessed by the use of the menu button. The numeric LED display of the detector shows the levels of radon gas in Pico Curies per litre i.e. pCi/L (the display range is between 0.0 and 999.9). The display for the short-term reading is an average of radon gas levels over the past seven days. Short-term readings allow the user to monitor any fluctuations in the home environment providing seasonal and weather-related variations also. A green LED next to the letter “S” indicates this short-term reading. If the measurement reaches 4pCi/L or more, with the exposure of 30 consecutive days or more, the audible alarm will ring. The display of the long-term reading is an average of the radon gas levels for the length of time that the detector has been powered on or has been the last reset. A green LED next to the letter “L” indicates the long-term reading. When the reading on the long-term reaches a level of 4 or greater an audible alarm will sound immediately. Upon the initial power-up, detector’s display will temporarily show an internal code including a few letters and numbers. This code determines if the detector is calibrated for use within the USA or Europe. The detector will conduct a self–test and the audible alarm will chirp four times. The display will then read “–” i.e. two dashes. These two dashes will remain until a sufficient sample has been obtained by the detector to create a precise reading. For short–term and long–term readings, samples need to be taken for at least 2 days (48 hours) before an accurate reading is displayed. Long-term readings display 4pCi/L or greater (alarms immediately, no 30 days delay). When the detector goes into an alarm mode, the buzzer will sound 4 chirps. This alarm will be repeated after every hour until the radon level on the long-term reading drops below 4pCi/L or until the user mutes the alarm. The menu button manages 4 different functions for the Safety Siren Pro Series 3 radon detector. These functions are controlled by the length of time that the button is pushed. This function is used to change the display between the short–term and long–term radon level readings. Press the menu button for one second. The display changes instantly with the release of the menu button. The LED indicator light next to the “S” or “L” point outs which reading is being viewed. If the menu button is held in for longer than 3 seconds, the display doesn’t change. The test function is used to assess the audible alarm. Press and hold the menu button for 5 seconds. The alarm will ring 4 chirps as if it is in an alarm condition. Release the menu button once the alarm begins to ring. This function allows you to silence the audible alarm. While in an alarm condition, press and hold the menu button for 15 seconds. As you surpass the test phase, the alarm will ring 4 chirps. The display will then read “Aoff”. Release the menu button immediately and the display returns to normal condition. If the long-term reading returns to controlled level, the audible alarm will be reset to the on position. If desired, the alarm can be reactivated by repeating the same process. On reactivation of the alarm, the display will read “Aon”. This function allows you to clear and/or reset the memory for both short–term and long–term readings. This is a mandatory step whenever the detector is moved to a different location. Press and hold the menu button for 20 seconds. The display will read “CL”. Upon release of the menu button, the “CL” keeps flickering until the memory has been completely cleared. Once the memory has been cleared, the display will read “—“ for 48 hours until enough sample has been obtained to provide an exact reading. The U.S. Environmental Protection Agency (EPA), Radiation and Indoor Environments National Laboratory (R&IE) have approved this device for radon gas level measurement. If you are a licensed radon measurement professional using this device for home inspections, etc., the EPA recommends a calibration and background check be performed annually. Contact Family Safety Products Inc. to request a Calibration Authorization Number (CA#) as the units without CA# will be returned to sender (freight prepaid). The fee for calibration is $75. The time taken is approximately two weeks. Annual calibration is optional for any private use of this detector. A homeowner who wants to request for a periodic calibration must also follow the same procedure. Same charges may apply. Every 24 hours, this radon gas detector will do a self–test. If there is a failure in this self–test, an error message will appear on the display. This error is normally from any kind of electrical noise interferences. This error can be caused by fluorescent lights, computers, televisions, or other electric items. The detector needs to be moved to a different location which is away from the items causing the interference. This error occurs on sensor failure to self-test. If this error appears, the detector should be unplugged for just five minutes and powered back up. You can also get your detector replaced if the Err4 code reappears. Long-Term Average from the time of the last reset. Maximum sampling time is of 5 years. The detector will automatically reset after 5 years of accumulated data. Family Safety Products, Inc. warranties this product to the original retail purchaser, to be free from any kind of defects in material and workmanship. This isn’t a transferable warranty and is effective from the date of the original retail purchaser only. Any defective units that are returned to Family Safety Products, Inc. within the warranty period will be repaired or replaced free of charge to the original purchaser. If you suspect that your detector is defective, please follow the instructions found below. You can contact Family Safety Products, Inc. by email at info@fspi-radon.com or by postal mail to receive a return authorization (RA) number. (Any products returned without the RA number will be refused and returned to the purchaser). Make sure to include with your detector the RA number, your name, address, phone number and description of the issue you are experiencing. (All returns must include a copy of the original purchase receipt also). While packing the detector, ensure that no damage occurs during return shipment. Write the RA number received carefully on the outside of the package near the address label. This limited period warranty is restricted to the provisions clearly stated above. Implied warranties, warranties of merchantability and/or warranties of fitness for a particular use are excluded. If any of this warranty is prohibited by federal, state or local law, that provision shall not be applicable. Received the Safety Siren Pro Series3 Mach 30/17. Installed it in my basement. Since then it has beeped and displayed readings, 5.9, 5.3, 4.9. what do these mean. The information that came with detector does not show me what is good or bad. I had my pro series 3 for over 10 years, and it showed the highest reading of 2.7. It is now continuously showing 4 and higher or err3. Should I replace it? My radon mitigation system is still working. Any information will be appreciated. Thanks for your query, my friend. Let me tell you that a reading of 2.7 pCi/L isn’t considered as an unsafe level. However, 4pCi/L and above is a dangerous amount. On the other hand, 10 years too is a sufficient time for a radon detector to be used. So, I recommend you to replace the device (you can choose one from our exhaustive list) and test again as your radon mitigation system is still functional. Test again and then decide whether the levels are fine or your radon system needs to be changed! Hi, you do not need a phone number to order the device. Check our radon detector reviews and choose the one that suits your preference. 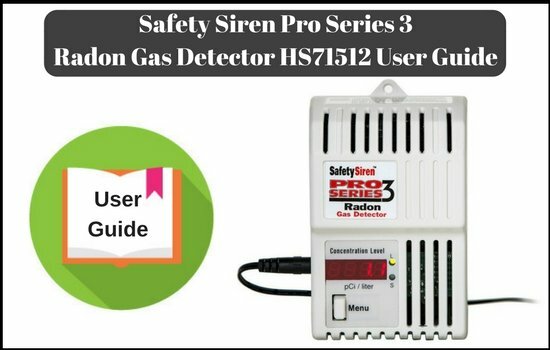 Check Safety Siren Pro Series 3 Radon Gas Detector HS71512 in case that’s what you want to buy and you can straight away make the purchase from our site itself. I had a previous incarnation, the Safety Siren Model HS80002. It looks the same, just isn’t labeled “Pro.” On its box, there is a statement, “7 year sensor life.” My question to you is, what does the new box say about sensor life? The old instructions made no mention of this fact. And the new instructions for the Pro model (as you quote them, above) don’t say anything, either. So, how long will this last, can I buy a new sensor for the old unit, etc.? Hey Mark, any radon detector that you buy has a shelf life of around 8 to 10 years. It means that this is the number of years your device will work perfectly well. After this time period, you must consider buying a new detector mainly due to the reason of advancements that could have taken place all this time. Any detector that you have bought previously or are about to purchase will all have a sensor life of 10 years max. If you notice any unacceptable readings or your device just doesn’t work, you may buy a new one. Read our Best Radon Detector For Home Use section to go for the best deal! Thanks! Hello, my detector is displaying a reading of 824.7. If the range is 0-4, Does this even make sense? I’m so disturbed. Until getting it checked, is avoiding the basement safe enough or the whole house is not safe? Dear Haidy, according to the conditions you’ve mentioned here, there must surely be some issue with your radon detector. We suggest you buy a new one. 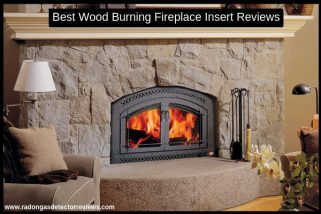 Consider our Best Radon Detector Reviews to buy the best device for home usage. Till then, it is best to avoid the affected area/s and go forward with at least purchasing a radon detector kit to confirm the numbers!